or, Happy Birthday Mister Moldvay! I’d like to see the interwebs celebrate the life of Tom Moldvay for his birthday upcoming on Monday, 5 November 2018. Let’s raise up a host of heroic Giants in the Earth! 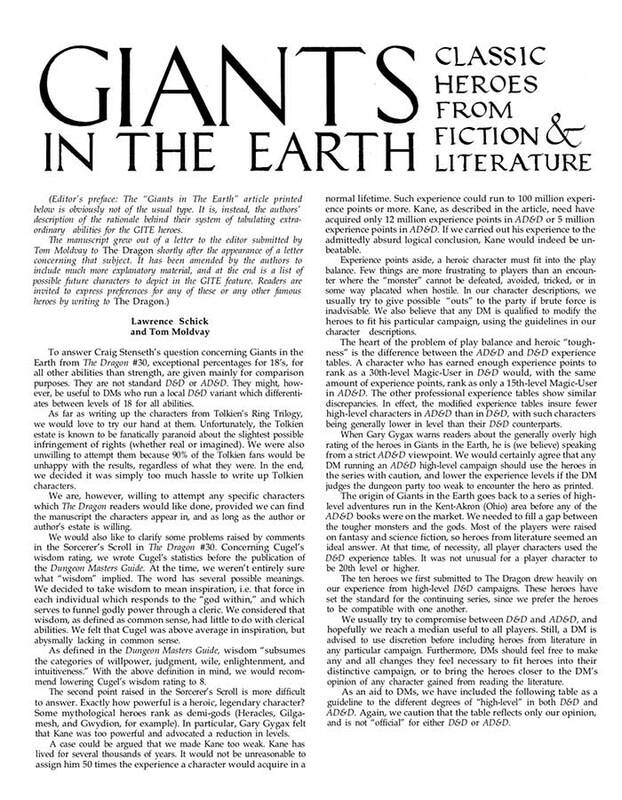 Tom Moldvay’s (and Lawrence Schick’s) Giants in the Earth is one of my favourite article series from the early days of Dragon magazine. 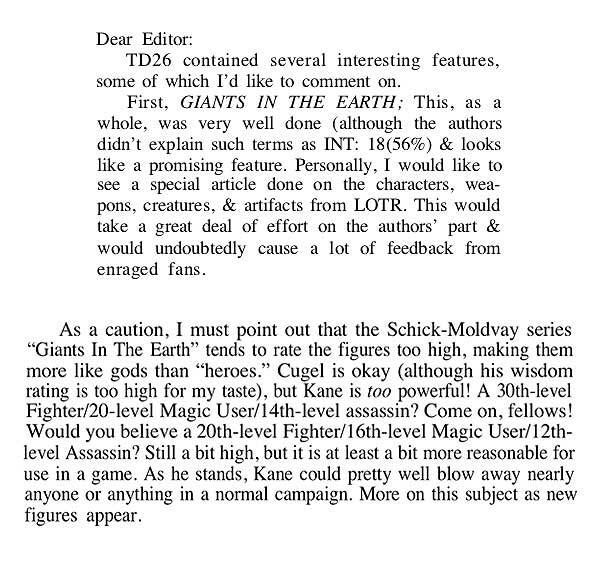 Their first hero – Cugel the Clever, no less – appeared in Dragon 26, dated June 1979. Moldvay’s last – Tiana Highrider – was published in Dragon 48 in April 1981. After Dragon 42 Roger Moore wrote more and more of the Giants. 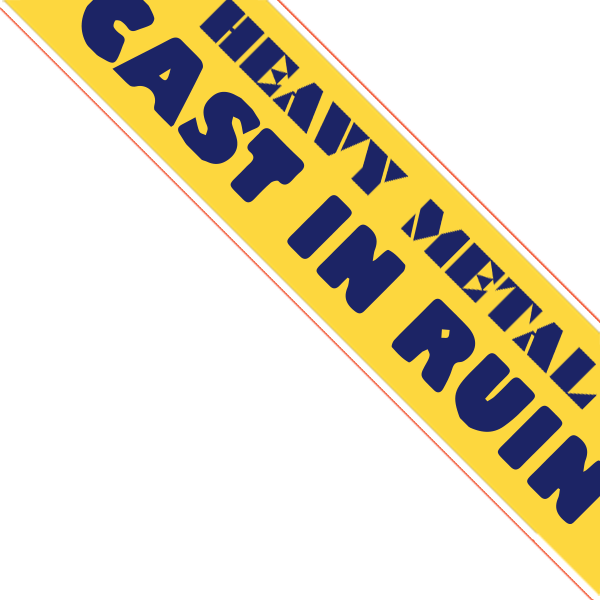 And the series stopped running altogether after Dragon 64. 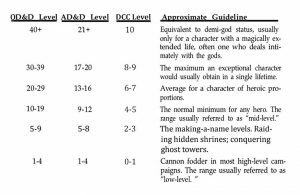 Then in Dragon 70 (pg 14) Moore wrote the article “Giants can be Awful or Awe-ful.” It presents some thoughts on what to do with these heroes in your campaign. 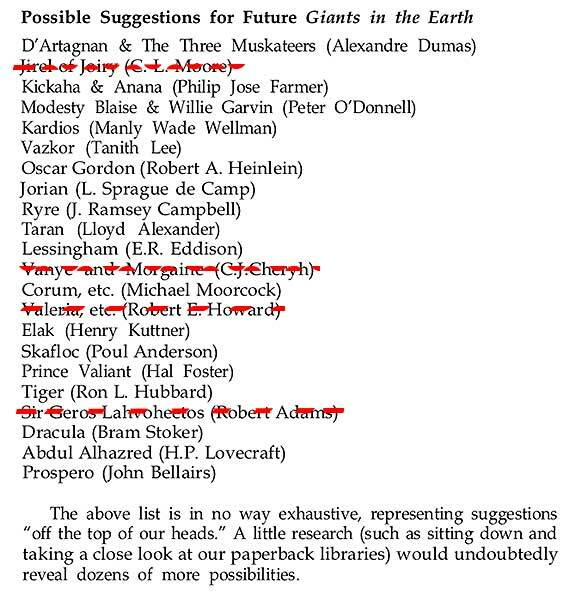 It also includes a list of all the Giants that were published plus some other Giants-like articles that followed. 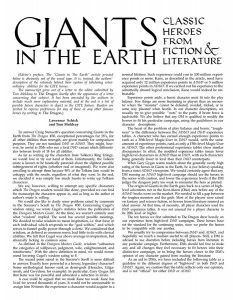 Moore’s piece is the last word on Giants in the Earth. Other than – and after they wrapped – Giants in the Earth, Dragon made two more attempts at something similar. Larger Than Life was a column that appeared only twice and Lords & Legends took all of three kicks at the can. 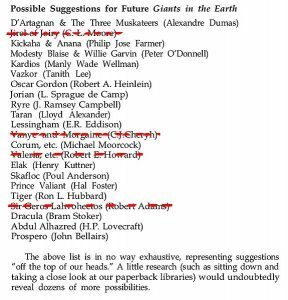 Posted below is a pdf list of all the characters published by Moldvay and others in Giants in the Earth as well as all the heroes done in Giants-like articles. 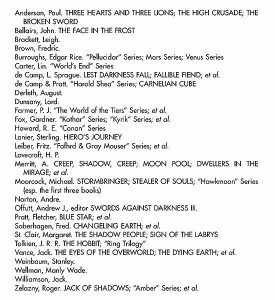 I didn’t include any heroes statted after 1st edition AD&D (round about Dragon 143). 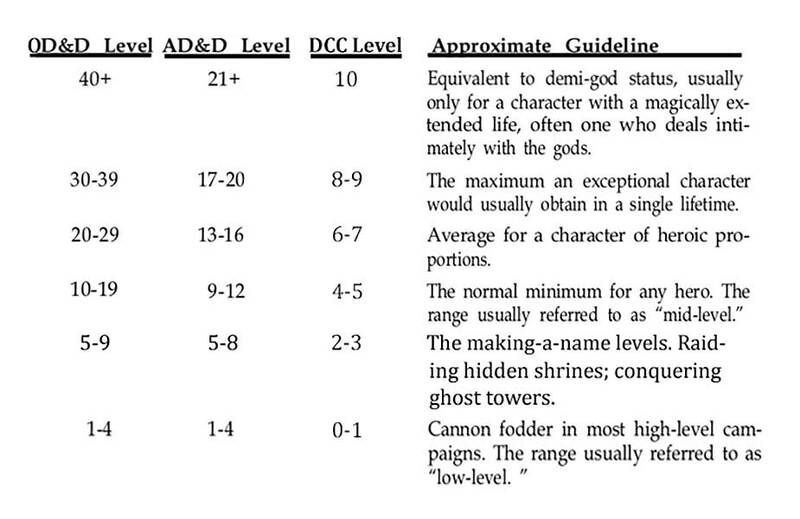 Likewise, I didn’t include any characters that were game-derived; so no Elminster, for example. 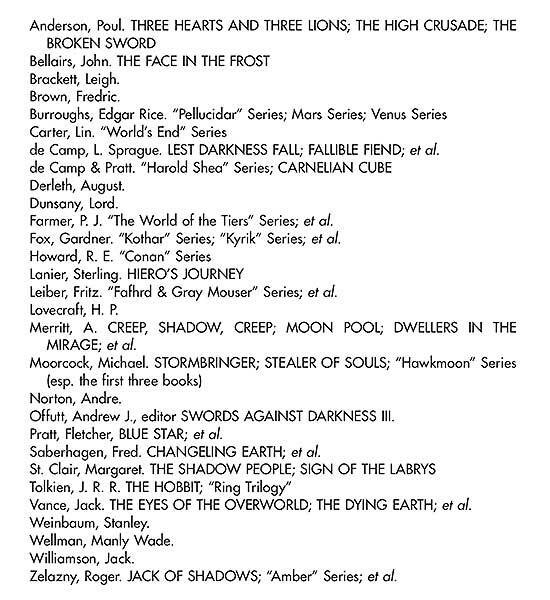 I also compiled a list of all the heroes in the original version of Deities & Demigods. Hero Fight, GO! If you do post a Giant (and ping me) I’ll copy/paste it into a group pdf and put it on the site, probably a week or two after the 5th; that’ll give me time to gather them all. Oh, and if I haven’t already mentioned it, The Dragondex is an absolutely amazing resource. Go, seek, find, enjoy. [Edit: There have been comments (both recently and over the years) about the high levels of Giants in the Earth characters. 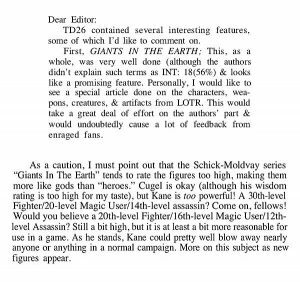 Schick and Moldvay do address that in their article in Dragon 37; indeed, comments like those are why they included the level breakdown chart above. To help illustrate that things did in fact temper over the course of issues, below is the list of heroes and their levels Roger Moore included in his piece from Dragon 70. There is a general trend of levels dropping out of the 20s into the teens (and even single-digits) as time goes on.